We’re just 12 days away from the start of Mariners spring training. The Mariners are getting an early jump on spring training because of the season-opening series in Japan against the Oakland A’s, March 28-29. With that in mind, we’ll start looking at the positional battles to make the 2012 Rainiers roster. Of course, this directly ties in with the Mariners final roster decisions. We’ll start on Wednesday with a look at the potential Rainiers catchers, and over the course of February we’ll work around the infield, move to the outfield, and then try to sort out the pitching staff. John McGrath went to Mariners FanFest and visited with pitching prospects Danny Hultzen, Taijuan Walker, and James Paxton. At the Seattle Times, Jerry Brewer has a well-written column on the Mariners rebuilding process. Left-hander Luke French, who was a free agent, signed with the Minnesota Twins. French was the ace of the Rainiers 2010 PCL championship team, so much that he got himself promoted to Seattle at the all-star break. From the Mariners themselves, we have a big photo slideshow from FanFest. If you went, maybe you can find yourself in a picture. Add-on: that first link was from Saturday; they put up another slideshow of pictures from Sunday. Here’s a nice baseball history story from Larry Stone, regarding Cal Ripken and the O’Brien brothers. Ripken will be in town this week. In the PCL, the Fresno Grizzlies hosted their annual Hot Stove Banquet on Saturday night. Former major leaguer Vida Blue was the keynote speaker, and the new Fresno manager spoke about the team. The Rockies haven’t yet decided if they are going to install a baseball humidor at the stadium in Colorado Springs. C’mon, guys, just do it. Sheesh. Check back on Wednesday for the catching round-up. Today we’ll follow-up yesterday’s post with links to the articles on all of the major league news that came out of the Mariners Pre-Spring Training Media Luncheon yesterday. But before we start with that, some good news just broke on Twitter: former Rainiers infielder/outfielder Matt Tuiasosopo has signed a minor league deal with the New York Mets, and he’ll go to spring training and try to win a spot on their roster. I have long held the opinion that Tuiasosopo is a better fit in the National League. His ability to play nearly every position on the diamond makes him a good candidate to win a major league bench spot in the NL, where the bench is used more frequently due to the pinch-hitting for the pitcher and the double-switches that result from that. We’ll be rooting for Tui to have a big spring and make the Mets. On another subject, the Mariners have signed veteran right-hander Brian Sweeney to a minor league contract. If Sweeney makes the Rainiers, this will be his third go-around with Tacoma. He pitched for the Rainiers from 1999-2003, and 2010. He’s spent a lot of time in Japan. Personally, I’m excited about this. Sweeney is a great guy to have on the club and he also is a broadcaster’s dream: he works quickly and throws strikes. John McGrath focused his column on Franklin Gutierrez, who apparently is over the stomach issues that have plagued him for two years. Larry Stone of the Seattle Times writes that the Mariners believe in their young core of players, while also being realists. It’s looking more and more like Ichiro won’t be batting leadoff this year, Stone writes. On his blog, Stone has ten bullet points from yesterday’s event. The Mariners invited Jeff Sullivan to the event, which turned out to not be as exclusive as he had anticipated. Shannon Drayer was there, and she posted her thoughts on her blog. While Five Guys definitely brings the goods, I agree with Sue Kidd that the local independent joints are better. Jesus Montero has been making the media rounds all week; here is a story with lots of quotes from MLB.com. Greg Johns wrote about Michael Saunders competing for an outfield job, and other notes. Jerry Crasnick, senior baseball writer for ESPN.com, filed this report on the Mariners. Also at ESPN, Dave Cameron wrote that the Mariners shouldn’t count themselves out just because they are rebuilding. Baseball America released it’s Top-10 Mariners Prospects list. They are the veterans in this field: here is the free list with an overview, and here are the complete scouting reports for subscribers. They chatted about it, too. Dave Cameron wrote about Baseball America’s list. The Mariners have five prospects who rank among the Top 100 in the game, according to MLB.com’s John Mayo. The Mariners FanFest is this weekend – here are all of the details. You have to be a Baseball Prospectus subscriber to access this, but Jason Parks continued his “what could go wrong?” series with a look at what could go wrong the Mariners top five prospects. Tacoma baseball Hall Of Famer Tom Kelly is having his uniform number retired by the Minnesota Twins. Things are always just a little bit different in New Orleans: the Zephyrs held their “annual cocktail reception” with their fans last night. Two former Rainiers pitchers who are now free agents have been hit with 50-game suspensions: Chaz Roe and Steven Shell. This has nothing to do with baseball, but I think it’s pretty awesome that former NFL quarterback John Kitna is returning to Tacoma’s Lincoln High School to teach math and be the football coach. Have a great weekend, and try to hit FanFest if you can! It’s been a busy 18 hours here, with the Seattle Sports Star Of The Year awards last night, and then the Mariners Pre-Spring Training Media Luncheon today. The media luncheon always serves as a wake-up call for me: it means the season is coming soon, and I better start prepping. There is a lot to cover. I’m going to do it bullet-points style, because a) I’m lazy in the winter and b) I want to finish before Pac-12 Thursday tips off. Major congratulations are in order to my occasional broadcast partner Bob Robertson, who was the recipient of the Keith Jackson Award on Wednesday night. After being introduced by Washington State athletic director Bill Moos, Bob received a standing ovation from the crowd at Benaroya Hall. Not surprisingly, Bob gave an outstanding speech (the surprise was in his attire: Bob wore a suit!). In his speech, Robertson touched on his long broadcast career, which began when he graduated from Blaine High School in 1947. He has called games for nearly every college in the state of Washington, and of course he’s been the voice of Washington State football for 44 years. He has never missed a broadcast – 508 games, through 2012. Other than Bob’s speech, the next-best thing to happen at the Seattle Sports Awards was the duo of Jay Buhner and original Guns N Roses guitarist Duff McKagen presenting the Pro Athlete of the Year Award. What would you give to sit in as those two spent the night swapping stories? Special thanks to Mortenson Construction for letting me tag along as their guest at the awards. Moving on to the Mariners event this morning, it was fun to see so many former Rainiers players who are now in the picture with the Seattle Mariners. 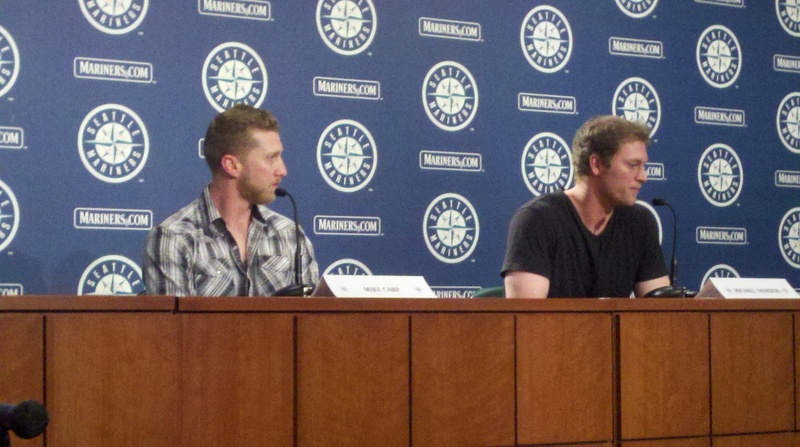 I mean literally in the picture – here’s Mike Carp (left) and Michael Saunders (right) addressing the gathered media. Hey, those are our guys! On a personal note, Saunders moved to Castle Rock, Colorado to be close to his wife’s friends and family. Castle Rock is half-way between Denver and Colorado Springs – the Rainiers team bus drives through the town four times a year. Not surprisingly, the city is named after a massive castle-shaped rock that sits atop a hill. Carp and Saunders have worked out extensively together in Santa Barbara, CA doing a “P3” workout. I have no idea what that is/means – although I am familiar with the “PS3” workout, which strengthens thumbs. To my eye, both Carp and Saunders appear to be in terrific shape. They were also in a good mood – after lunch they left with Rick Rizzs, The Moose, and a few others to go on Mariners Caravan stops back here in Tacoma, including a visit to the Mary Bridge Children’s Hospital. Carp touched a little bit on the passing of his buddy Greg Halman, and he said that he has stayed in touch with Greg’s family. One of my spies told me that Carp added to his tattoo collection with a Halman memorial piece. On that subject, the Rainiers have plans in the works to honor Halman – an announcement will come as opening day draws closer. I also heard a terrific idea to honor Halman that the Mariners are considering. There was much more Mariners major league news at the media event. I’m going to let the major league writers cover that – I’ll provide all of the links in Friday’s blog. However, I also picked up some nuggets about the Tacoma Rainiers 2012 team. More bullet points! The Mariners official roster lists hitting prospect Vincent Catricala as an outfielder, but new Mariners Director of Player Development Chris Gwynn said “versatility is an asset” and Catricala will play multiple positions this year. My opinion: look for Catricala to make the Rainiers opening day roster, and see time at first base and in the outfield. Assistant General Manager Tony Blengino said that the Mariners “are going to be young at Triple-A and Double-A.” My opinion: the Rainiers will be young at the positions, but the pitching staff might be a bit older. They’ve signed a lot of veteran minor leaguers to fill the staff. Don’t get your hopes up on seeing Kevin Millwood in a Rainiers uniform. Even though the former All-Star is on a minor league contract, it appears as if he has a very good chance of making the Mariners starting rotation. Both Eric Wedge and Jack Z mentioned that they hope Millwood can be a positive in the big leagues. I heard a rave about infielder Eric Campbell, a former second-round pick of the Atlanta Braves whom the Mariners signed as a minor league free agent. Apparently Campbell has looked good trying to learn second base, and he’s also impressed at the plate. He’s 26-years-old and has some power – could be a nice pick-up for the Rainiers. On the pitching side, I’ll be keeping an eye out for pitcher Philippe Valiquette in spring training. The hard-throwing lefty reliever missed all of 2011 with an injury, but I heard that he is healthy now and has an opportunity to make the Rainiers bullpen. The Mariners invited him to big league camp, so he’ll definitely get a chance to show his stuff. The outfield situation is going to be a real battle royale for jobs in spring training. The Mariners appear to be going with Ichiro, Franklin Gutierrez, Mike Carp, Casper Wells, and Chone Figgins as the jack-of-all-trades. Michael Saunders and Trayvon Robinson will try to play their way into that mix, but might end up in Tacoma. Then we have Mike Wilson, Darren Ford, Catricala, Johermyn Chavez, Carlos Peguero, Johan Limonta, and Chih-Hsein Chiang in the mix, with Jake Shaffer and Jamie McOwen standing by. What a mess! A source told me that Tacoma fan favorite Matt Tuiasosopo is currently weighing offers from three different National League teams, deciding which presents the best opportunity to return to the major leagues. On the all-time Tacoma statistical leaderboards, Tui ranks 4th in runs scored, 15th in hits, 6th in doubles, 14th in home runs, 10th in RBI, 8th in walks, and 2nd in strikeouts. That’s what roughly three full seasons in the Tacoma lineup will get you. Big congrats to pitcher Forrest Snow, who was invited to big league spring training camp. Snow went from 36th round draft pick to MLB spring training in just one-and-a-half years. Seriously, who does that? File this one under bad for him, but good for us: there was no talk whatsoever about Alex Liddi making the big league club. We’ll take him! Ex-Rainiers trainer Rob Nodine was at the luncheon – I assume for the free food. Now the Mariners assistant trainer, Nodine is looking for some quality family time before heading to Arizona in ten days. It was a fun day at Safeco – part of the fun is seeing all of the people you haven’t seen since September. I’m ready for the season to start. Check back Friday mid-day; I’ll have all of the Mariners links from the real sportswriters. The Prince Fielder saga finally came to an end yesterday, with the news that the slugger signed a nine-year contract with the Detroit Tigers for a reported $214 million. The length of the contract stunned many in the industry. I was certainly hoping for the Mariners to acquire Fielder, but not on a nine-year deal! He’ll be 37 years old when that contract ends, and it is reasonable to wonder if he will still be a star-calibre DH at that age. On the other hand, Fielder will be an instant help for the Tigers. Detroit will now be picked to win the weak American League Central division. It’s interesting that two of the best hitters in the National League moved to the American League this winter: Fielder and Albert Pujols. In The News Tribune, John McGrath thinks that the Prince Fielder contract is ridiculous. Now that Fielder has signed with Detroit, Larry Stone writes that the Mariners youth movement will continue. Knowing that Fielder isn’t coming to Seattle, Dave Cameron took a stab at setting up the Mariners offense. The Voice Of The Mariners blog has some background information on Hector Noesi, and news of a free Mariners autograph signing. In a free story, Baseball Prospectus prepares us for ten more months of agonizingly dull political debate by providing us with a list of 12 baseball players they would like to see as president. Former Tacoma Tigers pitcher Bill Caudill was the first big free agent client of agent Scott Boras. Sam Miller writes a great history for Baseball Prospectus, but you have to be a subscriber to read it. We’ve known since last summer that Reno was getting the 2013 Triple-A All-Star Game, but they had the big press conference just yesterday. Tacoma in 2015? Closing with a goofy one, Jeff Sullivan made fun of a bunch of minor league second basemen. He actually got paid to write that. The big Mariners-Yankees trade was officially announced by the teams yesterday afternoon, and there were no surprises. Michael Pineda and Jose Campos go to the Yankees in exchange for Jesus Montero and Hector Noesi. But the Mariners had to do something. This team has had the worst offense in Major League Baseball for two years running. While Dustin Ackley and Mike Carp provided some late-season hope that the offense might improve, the Mariners still have a long, long way to go to field just an average lineup in the American League. They needed a hitter desperately, so they traded for one in Montero. Montero is expected to become a middle-of-the-order power hitter – exactly what the Mariners need. These types of players don’t come around very often, and the Mariners took the opportunity to grab one with six years of team control before free agency. To do this, they had to move a premium player – and that was Pineda. The Yankees needed pitching, and the Mariners needed hitting. Each team had a young, emerging star that fit the other club’s need. Public opinion seems split on the deal. In one of his blog posts right after the trade was announced, Larry Stone wrote that according to the comments on the Times site, Mariners fans seemed split 50/50 on the deal. Then Stone went and looked at some Yankees sites and saw that their fans were also split 50/50 on the trade. That seems to mean it’s an even trade. Check back in six years and we’ll see who won the deal. But for now, I see it as a trade that needed to happen. Leading off, it’s the Seattle Times recap of the trade, with quotes from many of the subjects. In the two-hole, John McGrath writes that a former Tacoma Rainiers player helped Jesus Montero with his work ethic. Batting third, Montero was a guest on the Mariners Hot Stove League radio show last night. You can listen to the podcast here – Montero comes on shortly after the 19-minute mark. Cleanup man Jeff Sullivan has a little off-the-cuff trade background. Up fifth is The New York Daily News, which sent a writer to the Dominican Republic to visit with the newest Yankee, our old pal Michael Pineda. This is an excellent story adorned with photos of Pineda’s family and hometown. Hitting sixth, the Mariners made the signing of starting pitcher Kevin Millwood official. Batting seventh, former Rainiers (and Cal Bears) pitcher Brandon Morrow is getting paid. Hey, buddy, how ’bout a loan? In the eighth spot, there are lots of rumors that Prince Fielder may sign today. Larry Stone opinionates that Baltimore could be his landing spot. Of course, The Onion has figured out exactly why this is taking so long. And batting ninth, Ken Griffey Jr.’s son Trey is going to play wide receiver at the University of Arizona. And there are more than nine links. So much for that plan. John Sickels ranked the MLB teams by strength of farm system, and he has the Mariners #4. The Mariners PR Department now has a blog, called The Voice of the Mariners. ** You might want to bookmark it – I’ll see if I can figure out how to add it to the blogroll on the right. College baseball starts soon – here is the pre-season Top 25 from Baseball America. Oregon State is the only Pacific Northwest school to make the list. In the just-invented super-duper unlucky 13-hole, baseball historian and amateur movie buff Rob Neyer writes that “Moneyball” received four Academy Award nominations. That’s it for today – should have a lot of good blog content later this week. * especially to the Yankees. ** did the Mariners PR Department win a bet with Rick Rizzs to take that name? It sounds like the Mariners have signed another major league veteran starting pitcher to a minor league contract, with the intention of bring him to spring training and checking him out. Last week it was left-hander Oliver Perez. And today, according to Larry Stone of the Seattle Times, it’s right-hander Kevin Millwood. Millwood is a former star. The 37-year-old led the American League in ERA in 2005, and twice he won 18 games in a season for Atlanta early in his career. He has a lifetime record of 163-140, with a career 4.10 ERA. Last year, Millwood made nine starts for Colorado and went 4-3, 3.98. He also logged Triple-A time in the Yankees and Red Sox organizations. Will the cagey vet be on the Rainiers in 2012? It’s possible. The Mariners starting rotation, as it stands now, has “locks” in Felix Hernandez, Jason Vargas, and Hisashi Iwakuma. Battling for the remaining two rotation spots will be Blake Beavan, Charlie Furbush, Hector Noesi, Millwood, Perez, Danny Hultzen, Tom Wilhelmsen, and the other pitchers recently signed to Triple-A deals such as Matt Fox and Jeff Marquez. All of these veteran additions increase the chances that young up-and-comers like Hultzen, Erasmo Ramirez, and James Paxton will open the season in the minor leagues – and perhaps with the Rainiers. We’ll dive deeper into the Rainiers starting pitching situation next month, but as you can see there is going to be a lot of guesswork involved. Late last week, Larry Stone at the Seattle Times had a blog post about reclamation projects – and he did find some successes. This is pertinent to the signings of Oliver Perez and to a lesser extent, Kevin Millwood. Dave Cameron at USS Mariner likes the Millwood signing. The newest Mariners hitter – we think; still waiting for the official announcement – took the #1 spot on MLB.com’s list of top catching prospects. Former Rainiers infielder Mike Morse is getting paid. Hey, buddy, can I get a loan? There are rumors that the Oakland A’s might sign Manny Ramirez. Since Man-Ram has to begin the season serving a 50-day suspension, you know what that means: rehab assignment with the Sacramento Rivercats. Baseball America has reached the AL West with their Top-10 Prospects series – and they started with the Texas Rangers (subscription needed for link). I think this means they will release their Mariners list later this week. I’m a 49ers fan, so I was not happy with yesterday’s playoff game. I did not know that Kyle Williams – the second-year player who was pressed into punt return duty because of the injury to Ted Ginn Jr. – is the son of Chicago White Sox General Manager Kenny Williams. Later this week – Thursday – the Mariners host their annual pre-spring training media event. I’ll be up there and will have a report focusing on the minor league aspects of the discussion. The Mariners signed veteran left-hander Oliver Perez to a minor league contract, and invited him to major league spring training. Perez has had some success in the majors – but not recently. After solid seasons in 2007 and 2008, the Mets infamously signed him to a 3-year, $36 million contract – and he immediately struggled. In the final year of that contract – last year – Perez made 15 starts for Double-A Harrisburg, where he was the highest paid player in the Eastern League (by a margin, I’m guessing, of roughly $11.9 million). It appears that the Mariners have signed him to a standard minor league deal, so they won’t be on the hook for any serious cash. Injuries were a factor in his decline. Why not take a cheap look at him in spring training? Former Rainiers pitcher Yusmeiro Petit signed a minor league contract with the San Francisco Giants, and he’ll try to earn a spot with Triple-A Fresno. Petit pitched for the 2010 Tacoma PCL championship team, but he had injuries last year. Eventually he recovered enough to pitch a little bit in the Mexican League. Ten-year Mariners pitcher Jamie Moyer signed a minor league contract with the Colorado Rockies. Yes, he’s 49-year-old. Yes, he’s coming off elbow surgery. Yes, in all likelihood he would have to pitch in Colorado Springs to open the season. If he overcomes all of that and gets back to the majors, I say first ballot Hall of Famer on General Principals alone. Fact #1: you can get from Moyer to Babe Ruth in just four degrees of separation. Fact #2: the Rainiers host Colorado Springs on the opening homestand, April 9-12. I’m braving the weather to go see my beloved Cal Bears take their annual beat-down at Hec Ed. I’m just hoping it’s not a blowout ten minutes into the game – I want to be entertained! You are currently browsing the Booth, Justice and the American Pastime blog archives for January, 2012.